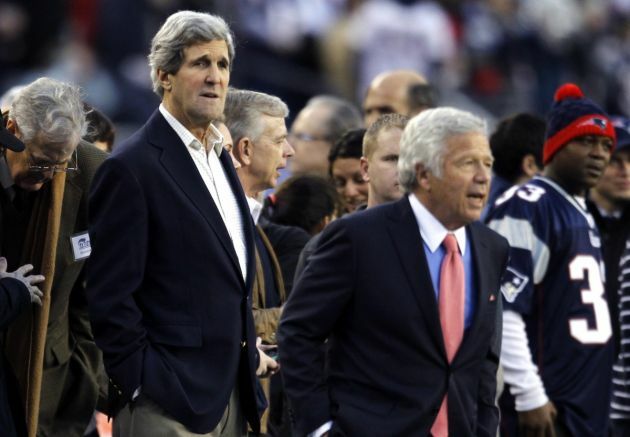 (Photo: Reuters / Jessica Rinaldi)U.S Senator and Nominee for U.S. Secretary of State John Kerry (L) (D-Massachusetts) stands on the sidelines with New England Patriots owner Robert Kraft before the NFL AFC Divisional playoff football game between the Patriots and the Houston Texans in Foxborough, Massachusets January 13, 2013. The popular narrative concerning Tim Tebow is that he is a distraction for any NFL team that deigns to sign him. He is the most recognizable and influential athlete in American sports although many believe his football skills do not warrant the hype that he brings with him. One of the reasons Tebow is so popular, and yet polarizing, is because of his willingness to regularly speak out about his Christian beliefs. While many thought his career was done because of the sideshow he creates, and have suggested he would be a better fit as a preacher than a quarterback, his faith may have just landed Tebow his new job with the New England Patriots. Team owner Robert Kraft said Wednesday that Tebow's spirituality was a factor in inking him to a contract as an understudy to superstar Tom Brady. Speaking to ESPN, Kraft noted that "you never know what happens" when a player like Tebow is signed. "But for me personally," he said, "having Tim Tebow on this team, he's someone who believes in spirituality, he's very competitive and works hard, and has a great attitude, and he's a winner. "So having him as part of our franchise is great, but he has to compete just like anyone else. We're blessed to have a lot of people like that, but the fact that spirituality is very important to him is very appealing to me." Kraft told USA Today, "You can't get enough people like him. Life is about collecting good people around you. You can't have enough good people." This is not the first time Kraft, who is Jewish, has commented favorably on Tebow's faith, according to the Washington Post. Before a 2011 matchup between his team and the Denver Broncos, a team Tebow led to the playoffs that year, Kraft said,"He's great for the NFL. The kind of young man he is and the values he represents, I think it's terrific. We just want to bring him down to earth this weekend. "We had a date with him last year here when he came (before the draft). He's a real, fine young man and I sort of like it that he's about spirituality and the country is thinking about spirituality." In a time when expressions of faith in the workplace, whether positive or negative, draw scrutiny, it was not surprising that Post reporter Elizabeth Tenety delved into the legality of the hiring of Tebow on the basis of his beliefs. "The majority of employers are barred from discriminating against a potential employee based on their religion," wrote Tenety. "The U.S. Equal Opportunity Commission's website notes that: "Religious discrimination involves treating a person (an applicant or employee) unfavorably because of his or her religious beliefs. But what about favorably? " Tenety quoted Charles C. Haynes of the First Amendment Center, who told her that Kraft's comments on the role Tebow's Charles C. Haynes of the First Amendment Center says that he thinks that Kraft's comments on the role Tebow's faith played in his hiring are perfectly legal. "There is a difference between hiring or retaining someone on the basis of religious affiliation, which could run afoul of civil rights laws prohibiting discrimination on the basis of religion, and hiring or retaining someone because, among other things, he or she is spiritually-minded or has good values. "I see nothing problematic for an employer to express admiration for employees who have faith commitments or good character etc. absent evidence that religious employees are treated more favorably than non-religious employees. This is an instance, I think, of a employer generally admiring the character of an employee, including the employee's spiritual commitments." Blogger Sean Tomlinson of the Score sports website suggested Tebow's future with the Patriots, at least as a quarterback, is dim. "Since there's no guaranteed money in his contract, the Patriots' minicamp and training camp function as a long tryout, he wrote. "Tebow's useless as a quarterback behind Tom Brady and Ryan Mallett, so if he can't be at least sort of OK as a tight end or running back, he'll be cut at no cost."